This weeks' BTT is: What book(s) do you find yourself going back to? Beloved children’s classics? Favorites from college? Something that touched you and just makes you long to visit? 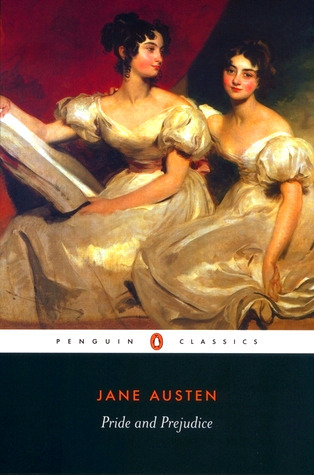 The first time I read Pride and Prejudice by Jane Austen, I was sixteen. I had recently discovered a love for historical/regency romances and came across a copy of this book in the local used bookstore I loved to haunt. I began reading it when I got home and wasn't able to put it down until I had finished the very last word on the very last page! Since then, I've purchased the BBC production of Pride and Prejudice (I love Colin Firth as Mr. Darcy) and I've re-read the book at least once a year. So I guess that makes it about 17 times I've re-read it? Give or take a few times. :) It's the book I turn to if I want a true comfort read and it's the only book I have that I own at least 3 different bindings of, if not more. But, I always find myself going back to read the particular version that I'd purchased at that used bookstore. Do you have a book that you return to occasionally? This is a great book. I've only reread it I think 2 or 3 times but with so many movie adaptations I find watchingit onscreen easier. I return to Harry Potter very often. I love that a classic like P&P is so important to you. Great pick!